In-dash GPS-based navigation systems offered at Bainbridge and Thomasville’s Precision Audio get you where you want to go. These are more than just digital maps; in-dash navigation systems also feature visual and spoken directions as well as thousands of Points of Interest (POIs) such as hotels, gas stations, restaurants and other common destinations. Many of our navigation systems at Precision Audio have real-time traffic integration for route selection or avoiding time-delayed traffic incidents. Our goal is to help you get where you’re going, easily and safely. Many customers ask why not just use a mapping app on their smartphone. 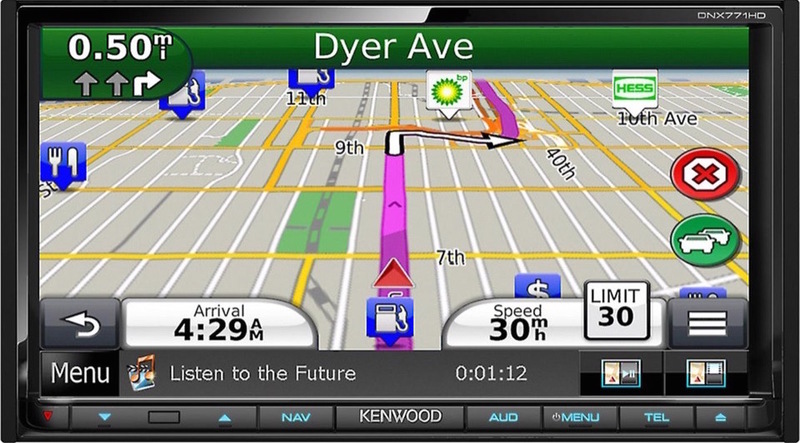 An integrated, in-dash GPS navigation system is far more safe and intuitive than maps on a smartphone app. By integrating it into the vehicle, the screen is much larger and easier to read than a smartphone and it is safer to operate. With in-dash navigation systems from Alpine, Kenwood and Pioneer, the spoken commands broadcast over the vehicle’s audio system instead of through the smartphone’s small, difficult to hear built-in speaker. GPS navigation systems installed at Precision Audio also have a connection to the vehicle’s wheel speed sensors which more accurately reflect the actual vehicle speed and estimated time for the driving route to a given destination. Precision Audio offers multimedia radios from Alpine, Kenwood and Pioneer with integrated GPS navigation. Each has easy-to-view screens with intuitive touch-screen controls. We have all models on display in our store. If you’ve been considering an in-dash head unit that includes GPS navigation, visit or contact Precision Audio to learn more about what’s available. In-dash navigation systems have much larger and easier to read screens than a smartphone, thus making it safer for the driver to glance at the screen to see visual cues or street names. In-dash navigation systems are specifically configured to change screen information as you approach critical steps in a route, such as freeway exits or intersections where you’ll need to turn or be in a specific lane. Listen to music at the same time as you allow the in-dash navigation maps to guide your route. Spoken directions are integrated right into the unit and will temporarily mute and pause the music while the directions are spoken. That leaves both hands on the wheel and eyes on the road. All of our in-dash navigation systems at Precision Audio utilize three methods to determine location and movement of your vehicle; GPS, wheel speed sensors and a three-axis accelerometer built into the radio. A smartphone typically only has a GPS signal. In inclement weather or areas where coverage to an open sky is a challenge, the in-dash navigation system maintains the route. Should you have a factory entertainment system that did not come with the navigation option from the factory, Precision Audio can often add navigation functionality to your existing in-dash equipment. Since most new cars have an in-dash LCD screen for audio, HVAC and other vehicle information functions, an aftermarket upgrade utilizes this LCD screen to display the navigation upgrade. The complete upgrade displays and functions on the screen just as the factory option would. Many vehicles with a non-touch LCD screen can be touch-screen enabled so the GPS navigation system is easier to control. Our factory navigation upgrades feature more current maps than the factory-installed systems. Similar to our multimedia radios, these systems are easily updated with USB or SD Card downloads. 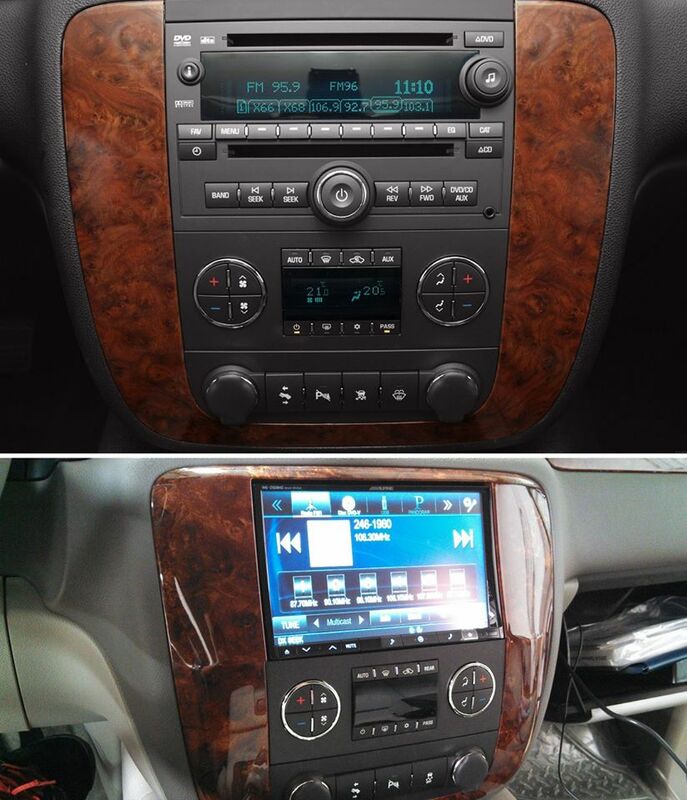 Visit or contact Precision Audio to learn more about what’s available for your factory-installed car stereo or in-dash LCD screen. When new roads or mapping information is available, an in-dash GPS navigation system from Precision Audio is easily updated over the Internet with a download to a USB or SD card that is transferred to the navigation system. Our friendly and helpful technicians will even download and update your unit for you, if you like. Not sure what in-dash GPS navigation system is appropriate or available for your vehicle? No problem. Visit or contact us today and one of our expert product specialists will help you something to fit your needs. Whether you are taking road trips to the mountains, coastal areas or you travel often for your job or just wish to organize daily driving for more efficient routes, at Precision Audio we offer customers a variety of comprehensive solutions for in-dash navigation that promotes safer and more productive driving. Stop by one or our stores today or call (229) 246-2111 (Bainbridge) or (229) 233-5001 (Thomasville) to schedule a no-cost consultation.